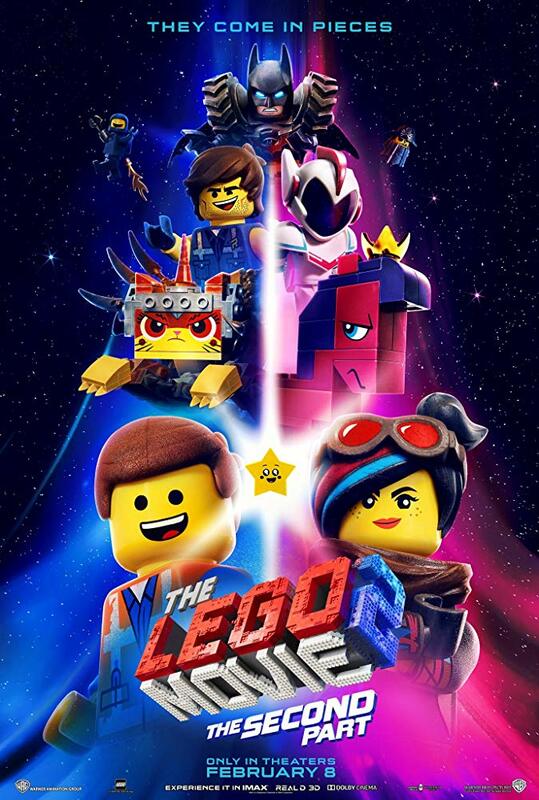 The original Lego Movie was a surprisingly unique animated hit that surprised critics and audiences alike back in 2014; not a cinematic attempt to milk the beyond renowned construction toys in a cheap and uninspired manner but one using their appeal to its advantage to tell a surprisingly well thought out narrative with a solid blend of heart and humour. A sequel was thus more than welcome, while I won't claim to be as won over as many, it certainly remains once again a decent mixture of familiar themes and family friendly laughs. Five years following the events of the first film, the world of Bricksburg has been left a post apocalyptic wasteland following the attacks of Duplo invaders, caused by confrontation over the real world Lego set between siblings Finn (Jason Sand) and Bianca (Brooklynn Prince). Ultimately, these attacks leads to the abduction of multiple Bricksburg citizens, including Lucy (Elizabeth Banks) and Batman (Will Arnett), forcing rookie Master Builder Emmett Brickowski (Chris Pratt) on a quest to rescue them from the Duplo army before it's too late. If you've seen glimpses of any of the movies within this franchise thus far, then you'll know it goes without saying this main sequel is a winner in the visual department without question; not only beautifully rendered, but also adopting a charming style of animation that's reminiscent to stop motion, which of course truly works for the central premise. The animated world of Lego is also blended with the occasional intervention of live action scenarios which depict their influence on the world itself; a clever a concept just as it was in the original, though one that does admittedly get a bit too excessive and farfetched this time round, primarily as we reach the film's climax. Speaking of the climax, that in general is where the story itself loses some traction, developing clever twists just as the original film did but then using some strange contrivances in order to make these twists come to fruition; the initial revelations have their impact, but the eventual explanations behind them leaves them rather bizarre. The story as a whole is fairly entertaining, overcoming many of its weaker traits thanks to its consistently witty and approachable humour, charming cast of characters, and the refined vocal performances used to bring said characters to life, namely the efforts Chris Pratt as our key protagonist Emmett, and especially Tiffany Haddish as new antagonist Queen Watevra Wa-Nabi. Ultimately, The Lego Movie 2 is funny and heartfelt, but while its narrative has lots of potential, the execution doesn't quite feel as inspired as it potentially could be; ultimately, many audiences won't be bothered by this, but it ended up leaving me a tad bored and bemused at sporadic moments.